Paris: Chez Les Freres Levrault, 1802. First edition. Hardcover. Maroon library cloth, Very good. 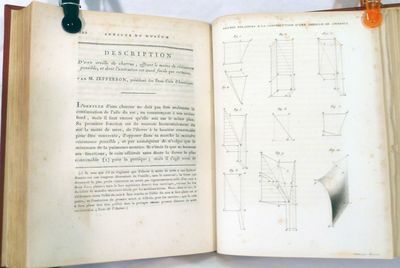 Pages 322 - 329 with a full page plate bearing ten figures (illustrations) for the construction D'une oreille de Charrue -- Jefferson's new design for a plough-ear which he tested in Monticello. This article appeared in "Annales du Museum National d'Histoire Naturelle" -- Tome Primiere with 32 engraved plates (2 folding, one colored). Jefferson wrote to A. Thouin, a major contributor to the Society: "I have made a small alteration in the form of the toe of the Mould-board, which, while it preserves the principle untouched enables us to shorten the ploughshare six to eight inches, which is preferred by the agriculturists here to the first form." He sent Thorin a small box containing the model, and calls himself "not to be adept, but only a zealous amateur in the objects of the society." Ex-library, Harvard College bookplate.